A palm oil farmer displays palm oil seeds in Kampar, Riau province, Aug. 20, 2018. 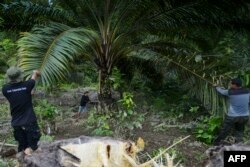 Indonesian palm oil farmer Kawal Surbakti says his livelihood is under attack: The European Parliament is moving to ban the use of palm oil in biofuels. Indonesian rangers cut down illegal palm oil trees within the protected Leuser ecosystem rainforest in the Subulussalam district, Aceh province, Jan. 9, 2019. 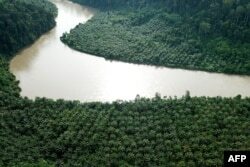 FILE - An illegally planted oil palm estate in the protected Gunung Leuser National Park in Aceh, Nov. 1, 2018.